I’ve been going through my Pinterest boards today, tidying up… You know. The tidying up you do when you don’t want to actually get up out of your chair. And I realised that not only have I had a white fetish lately, but I’ve also become infected with an aqua/turquoise/sea foam obsession. The white obsession started with my kitchen in Fentonbury where I painted all the walls and cabinets white. I managed to add in a touch of vintage green with the meat safe and grey with the polka dot vase. 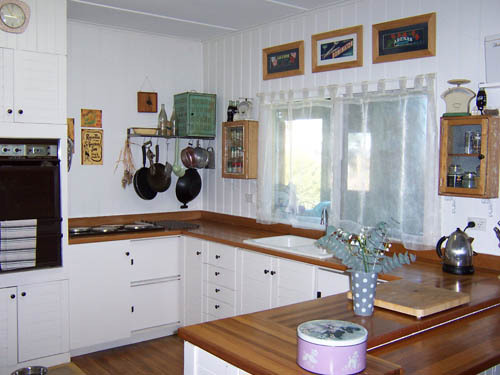 I’d love an all white with timber benchtops and touches of grey and vintage blues kitchen on the farm. I’d love white on white, cream and soft natural colours all throughout the house in fact. My love affair with a certain type of blue started with my bathroom in Fentonbury. I painted the walls a pale blue called Snow Glow by Wattyl. Love that colour. Only now, I’m leaning towards a bit more of a sea foam/minty green blue… Maybe not quite as green as these paint samples… but not far off either. Maybe its got something to do with missing Greece and the crystal clear waters I love swimming in. Maybe its got to do with the vintagey-ness of those pale blue greens. Whatever it is, I see photos like these and my heart goes ‘Ahhhhhhhhhhhh’. Love this grey/greeny blue in the bathroom, coupled with white. Its so good I want to eat it (almost). 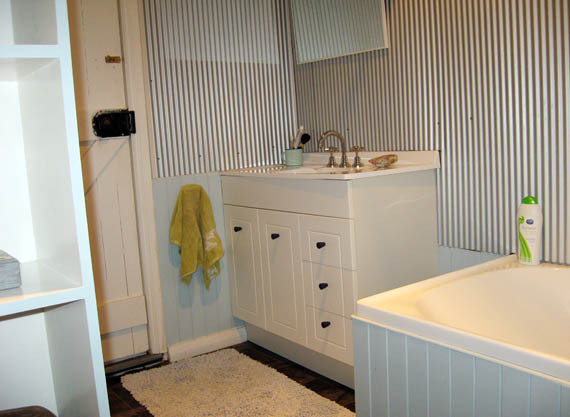 And I want timber panelling on my bathroom again (as opposed to stupid laminate tile sheets)! I mean, how fresh and clean is this? You’d feel clean even just walking into a bathroom like this! Love the combination of beige, taupe, brown and the turquoise blues. With creamy whites of course! And look at this… swoon…. I have the bottles. I have (different) old wire containers. I just need that cabinet. Look at these colours. The mustard colour is similar to the colour I painted my hallway and office in Fentonbury. I would love to use this combination in my kitchen. How is this for decadent and beautiful. I want one! I have a small brass chandelier. Surely I can do something like this with it! Note to self: search for turquoise crystals on ebay. Only problem is I’d have to get an electrician in to get rid of the stupid fluoro lights in the living room. Who puts fluoros in the living room? The people who we bought from, that’s who! Or what about this? White chandelier and white furniture…. oooooh…. See? Those colours are everywhere on my boards! I mean, I knew I had a problem, but didn’t know I had it so bad. When you go through your pins and see the same colours appear time and time again in all different images, different spaces, different items, you know its time to do something. Why get a paintbrush and start painting! I have to pick the actual colours first. And decide what colour will go where. I have some plans ideas. I want to paint the guest room white. A soft white. The mudroom white with aqua bits. Our bedroom a softer bluey green. The living room either a creamy white or a pale grey to compliment the dark grey wall at the far end – very similar to the last colour in this palette. When we first moved here I picked a pale grey for the main walls in the living room and that dark grey for a feature wall. Problem is now I look at the pale grey and all I see is a blue I don’t like. Maybe I need to go lighter/whiter/greyer…. a warm instead of cool grey. These colours for the living spaces – greys, whites and bits of blue…. Yum. I am so itching to get my paintbrush out, listen to loud music and get to work! Well, I better go wipe the drool off my keyboard. Soft and cool. Lovely, Zefi.